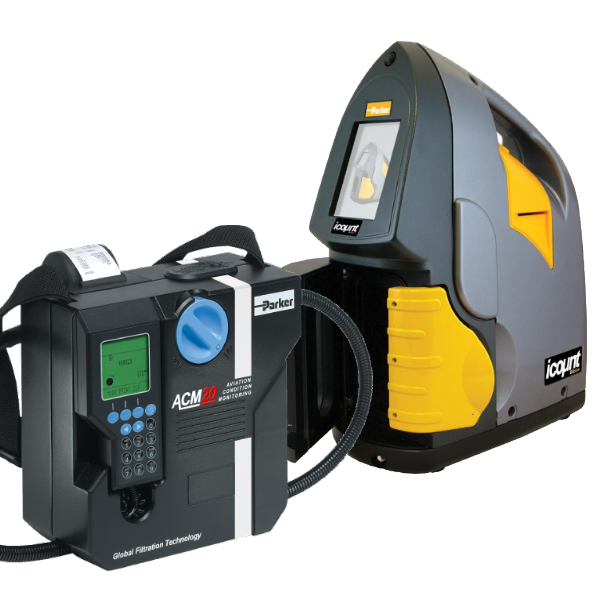 The Velcon Contaminant Analyzer provides assurance that the fueling system receives, maintains, and dispenses fuel that meets ASTM D975 and ISO 4406 cleanliness levels. The VCA is an ideal tool to either measure the quality of fuel at receipt, assuring cleanliness specifications are met, or at dispensing points. The Integrated Particle Monitor represents the most up-to-date technology in solid particle contamination analysis. The IPM is a compact, permanently-mounted laser-based particle detector module that provides a continuous, cost-effective solution to fluid management and contamination control. The icountACM20 Portable Particle Counter was developed from existing technology for monitoring contamination in AVTur and other hydrocarbon fuels. In addition, the ACM can be used to monitor fuels from existing sampling points in locations from refineries, pipelines, distribution terminals, fuel supply storage. The revolutionary icountBSplus is an advanced, fully contained bottle sampling system that ensures fast, accurate and repeatable detection of contamination in diesel fuels. Compact and portable, the icountBSplus is ideal for use in the laboratory, on-line or off-line applications. The icount Fuel Sampler (iFS) is an innovative solution to the challenge of measuring the quality of hydrocarbon fuels in many different applications: from renewable energy, marine and offshore, to manufacturing, mobile, agriculture, military and aerospace. Compact, lightweight and robust, the truly portable iFS makes field analysis simple, quick and easy.